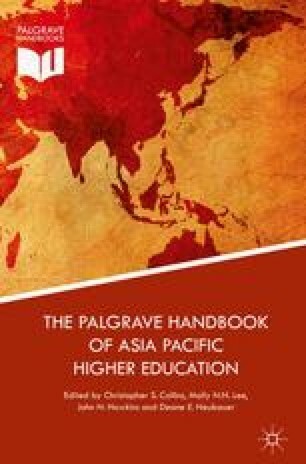 This article is to explore the changing landscape of quality assurance (QA) regimes in Taiwan and Hong Kong, with particular reference to see how the implementation of QA exercises has affected university governance. This article focuses on three aspects of examination. The first is the changing roles of various actors including governments, QA agencies and higher education institutions (HEIs) in QA. The second dimension is to examine to what degree that HEIs have been “monitored” or “intruded” when QA is becoming more frequent. Finally, how the evaluation report or result is used also act as an important indicator for understanding who retain dominant power among different actors. Both notions of decentralization and recentralization are used to compare the different emerging trends in Taiwan and Hong Kong. Opposite developmental direction can be found in these two societies. Higher Education Evaluation & Accreditation Council of Taiwan (HEEACT). 2013. Mission statement. Available online at: http://www.heeact.edu.tw/ct.asp?xItem=1091&CtNode=445&mp=4. Accessed 12 Oct 2014. TLQPR Review Team. 1999. A campaign for quality: Hong Kong teaching and learning quality process review. TLQPR review Team. Available online at: www.ugc.edu.hk/eng/ugc/publication/prog/tlqpr/tlq_fr_r.htm. Accessed 16 Jun 2011. University Grants Committee (UGC). 2007. Mission statement. University Grants Committee. Available online at: www.ugc.edu.hk/eng/qac/about/mission/mission.htm. Accessed 16 Jun 2011. ———. 2010. Aspirations for the higher education system in Hong Kong—Report of the University Grants Committee. University Grants Committee. Available online at: www.ugc.edu.hk/eng/ugc/publication/report/her2010/her2010.htm. Accessed 16 Jun 2011. ———. 2011. UGC annual report 2010–11. University Grants Committee. Available online at: www.ugc.edu.hk/eng/ugc/publication/report/AnnualRpt_2010-11.htm. Accessed 21 Jun 2011.